Mummy do that! : Let's hear it for the multilingual kids! Let's hear it for the multilingual kids! Hello my lovely readers, it's my favourite time of the month, and that can only mean one thing, it's bilingual carnival time! This time we have a few newcomers joining the usual suspects, and as ever a great selection of posts all about raising children bilingually. So I hope that whether or not you raise your children with more than one language, you will enjoy this selection of posts. Hopefully it'll encourage some to start or continue the bilingual journey with their children, or you may get some new ideas how to make the trip that little bit more exciting for yourself and your children. So sit back, grab a cuppa o una jarra and enjoy the read. If you're looking for great resources to boost the target (read: minority) language, drop over at Hobo Mama who has the cheater's guide to making up bilingual children's songs. Not cheating at all in my humble opinion, but easy peasy and very effective! It also goes to show that you don't need to be a native speaker to raise your children with two languages. More resources can be found at Blogging on Bilingualism. Second in the serious of resources is a collection of DVDs in French, and previously I was particularly interested in the first instalment which was all about German resources. If you have any resources for other languages, make sure to head over and you may even be able to do a guest post on the blog! Intrepidly Bilingual is looking back on her journey so far in Hanging On. Raising children bilingually is unfortunately not necessarily the easy option and sometimes it can be fraught with doubts. In the end though, it can only be worth the effort. Very Bored in Catalunya also struggles with the raising her boy bilingually. With a slight language delay in his home language, he is now struggling to understand the teachers in his school, but help is at hand to boost his Catalan. Where Going Havo? is taking a closer look at the relationship between grandparents who are largely monolingual, and bilingualism in Grandparents and the Cost of Bilingualism. It is a post many of us will be able to nod their heads to, when bilingualism is both a link and a place that grandparents can't follow. Over at Verbosity, Solnushka is all philosophical about the attempt to impose meaning on the protolanguage(s) emerging from Baby's mouth. But don't worry, it's not all that serious stuff, but rather amusing when the parents are trying to get better at deciphering their offspring's utterances. Fast forward a year or two, and you'll be where my own self is at presently, when our now preschooler is getting a kick out of inventing her own language and finding the power of it all simply hilarious, while mummy and daddy stand by and shake heads. Mary Yucel Ankara shares her journey of raising two children bilingually in English and Turkish, how she came to the OPOL (one parent one language) approach after much consideration and that language delay is not something to be worried about. But you don't have to follow the popular OPOL method to give your child a multilingual start, as Elisa's daughter Beli proves in Which language do I speak: Spanglish, Spantian or Crolish? I just love the trilingual mix that comes out of the 22 month old's mouth! Little M. blogs at Mummy's Busy World and is very proud to be speaking two languages already. It seems Little M. has done his research and can tell you all about why it's so great to be a bilingual tot! And you can now even find a multilingual family corner on the blog, now, how good is that??? Finally, you may encounter unusual things when on a Day at the German Embassy, as BabelKid can tell you. Would you raise your child bilingually if neither of the parent was a native speaker of the "other" language? And would you make sure your child spoke the community language better than you by withholding the parent language? And yet, haven't many of us been there just there (personally I received informal speech training when at primary school to fully eliminate any trace of parental non high German accent and my dad never taught me a word of the rich dialect he grew up with)? Stop Press: It appears that a submission has escaped my eyes, so here's a late edit to include Losing Language by Mamapoekie, who much like me has to focus in order not to let the community/majority language creep into her life. And how raising children bilingually may help not just to pass on a language, but to also keep it alive for the parent. 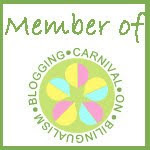 If you want to subscribe to all the instalments of the bilingual carnival, look at previous carnivals, contribute to the next one or even offer to host it on your blog, don't forget to stop over at the Bilingual Carnival page over at Bilingual For Fun where you can subscribe to the newsletter and never miss a bilingual carnival again! Thank you for including me in your post!!! !I have started to read some of the other blogs and they have great insight into raising a bilingual child. Hey, where did mine go? mamapoekie, sorry got that wrong! I never saw your post, it must have slipped by, but I've included it retrospectively. Really sorry about this! Thanks so much for organizing the carnival this month. I'm going to look for that German DVD list as well — I can always use recommendations. So much goodness to read! Yea!